Facebook is a great medium to share information. With just one click of a button you can instantly share to everyone on your friends list a status, photo, article, or video. Even better, people can then share things that you post to everyone on their own friends list. This makes Facebook the perfect platform to spread awareness of the current events, and issues that JONAH is working on. In order to spread this awareness on Facebook, we need your help. There are four main ways that you can help! Liking JONAH’s Facebook page is important because it helps you stay updated with what’s going on in our organization, and it also shows us that you support JONAH. It also gives you the ability to help spread awareness about JONAH. 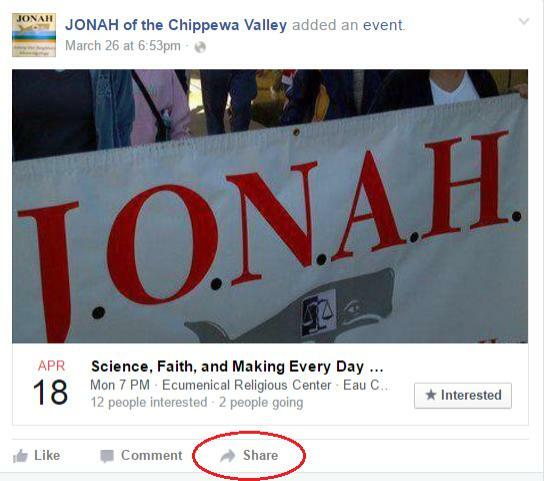 To find our Facebook page search for JONAH of the Chippewa Valley, and then click the “Like” button. You can invite people on your friends list to like the JONAH page. That way your friends can also get updates on what’s going on in JONAH such as events that we are hosting, or what sort of issues we are currently focused on. All you have to do is click the “Invite friends to like this Page” button on JONAH’s page. It’s the button circled in red below. Once you hit this button, a search box will pop up, and all you’ll have to do is type in the friends you want to invite and hit enter. 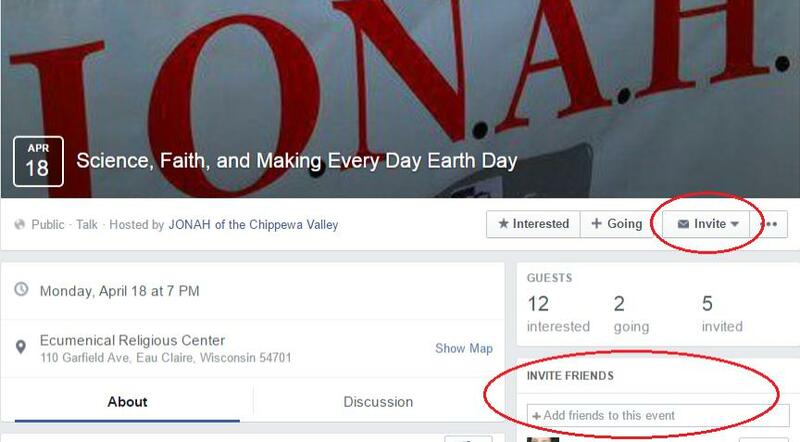 You can also invite people on your friends list to JONAH events on Facebook. Spreading awareness about events that JONAH is hosting is important because when more people attend our events, more people are learning about issues that JONAH addresses. Facebook allows only fifty event invites per person, so it’s important for everyone to join in on inviting others. There’s two different ways that you can invite people to an event. You can click the “Invite” button that sits next to the “Going” button. Or there is a box below those buttons where you can just type in your friends name, and then click enter to invite them. Both options are circled in red below. Finally, you can share JONAH’s posts onto your own Facebook. This is a perfect option if you don’t feel comfortable inviting people to like the page or join. You might even be surprised to see who from your friends list is interested in these posts! To share posts or even events, all you have to do is click the “Share” button that is circled in red in the picture below.